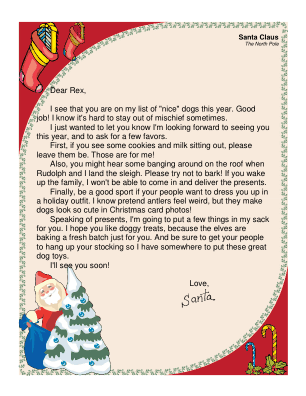 Every good dog should get this printable letter from Santa, in which Santa agrees that it's hard for pups to stay out of mischief and warns that the noise on roof is just his sleigh. I see that you are on my list of "nice" dogs this year. Good job! I know it's hard to stay out of mischief sometimes. I just wanted to let you know I'm looking forward to seeing you this year, and to ask for a few favors. First, if you see some cookies and milk sitting out, please leave them be. Those are for me! Also, you might hear some banging around on the roof when Rudolph and I land the sleigh. Please try not to bark! If you wake up the family, I won't be able to come in and deliver the presents. Finally, be a good sport if your people want to dress you up in a holiday outfit. I know pretend antlers feel weird, but they make dogs look so cute in Christmas card photos! Speaking of presents, I'm going to put a few things in my sack for you. I hope you like doggy treats, because the elves are baking a fresh batch just for you. And be sure to get your people to hang up your stocking so I have somewhere to put these great dog toys.